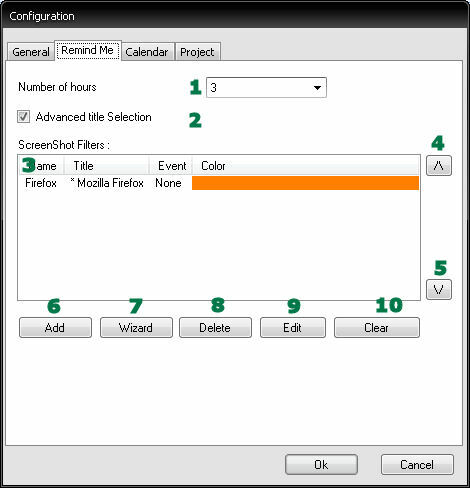 To make it possible that you can see easy back in time you have to set filters for the different programs or part of programs you have worked on or are planning to work on. These filter have only to be set once. So if you for example use internet explorer on a daily base and you want to see when you have worked on you have only to make one filter named internet explorer. this part of the guide will walk you through the process of making these filters. Go to the Premember configuration. click the Add(6) button in the Premember Configuration with the “Remind Me” tab selected. 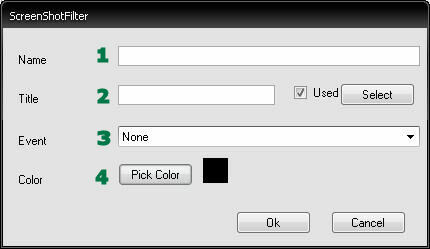 Premember Configuration with Project tab Selected. Insert the name you want the filter to be named (e.g Internet, Word, etc). This is the title of the window you want to filter on if you for example want to make a filter that filters on Windows internet explorer you have insert the text “*Windows Internet Explorer” in here. You can also click the “Select” button to get the window title from a particular window. Here you see the 3 latest windows titles that where selected. You can simply select a program window and then select Premember again to see that the window title is added to this list and selected. This is a advanced option so you can filter on events that where fired when the screenshots where saved. The default option is none so the filter is set to see all the windows set inside the title field. The color you want to see in the remind me window when this window was active. Click “Ok”, Now the filter is created and you will see a color in the Remind Me window when this Window was active.